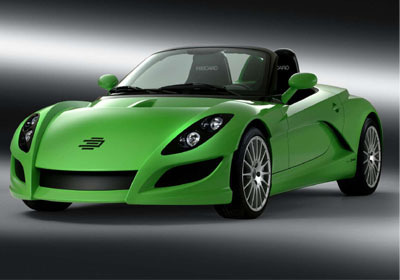 The EDAG No.8 roadster concept was shown at the 2005 Frankfurt Motor Show. The No.8 concept is designed for the fun and extroverted lifestyle. The concept is based on the SMART Roadster platform, with only cosmetic changes. "We designed the EDAG Show Car No. 8 for a target group that wants to express their individuality and positive attitude to life." The EDAG No.8 has more than a hint of Lotus Elise familiarity, but why not, it's a proven formula. The front end is particularly menacing with slim, dark headlights and three piece grille, echoed by the rear valence with twin center exhausts. The rising waist line, emanating from the rear of the front arches helps the EDAG No.8 achieve a poised, taught stance. The center mounted rear airscoop however looks over the top, and does little favors for the No.8's overall appearance.